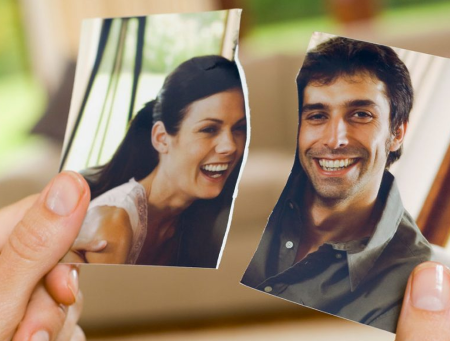 Making your ex come back is even more popular than finding new love, so I figured it was time to come back to an old favorite purpose and add more spells for this. You may have already seen the original page of "get your ex back" spells. Here are a few more. You will be cutting this photo in half, so please make a copy if you don't want to damage an important original. The spell will still work fine. If you don't have or use an athame (a sharp ritual dagger or knife), you can use a clean kitchen knife. No scissors. To get started, light both the candles. The red one should be on your right, and the black one on your left. In the center, light the charcoal on a heat-proof surface. Place a few coriander seeds on the charcoal and wait for them to start smoking (you may need to have an open window handy). Hold each half of the photo up, allowing the smoke from the coriander to flow up between them. Repeat the words again. Now set the pieces together so they overlap. Precision isn't too important. Drip black wax on them to bind them together, then more drops of red wax on top of that. When the wax cools, the pieces should stick together. Snuff out the candles, and leave the photo on the altar between them until you see your loved one coming back into your life. This spell to make your ex come back is the "charm bag" type. Once you make the charm, you need to keep it in a purse or backpack so it's with you all the time. If you don't carry a bag, this may not be the best choice of spell. Bring back what is dear. Bundle up the fabric around the items, and tie it tightly closed with the black yarn. Now carry this with you throughout the day. At night, leave it near the bed. It will soon draw your ex back to you. As I've said, these are spells to make your ex come back, not for bringing a new relationship into your life. I have other love spells that work for that.